According to a recent industry report, two housing markets in Idaho could lead the nation in terms of home-price growth, going into 2020. The Idaho Falls and Boise-Nampa metropolitan areas both received strong housing market forecasts covering the next 12 months. In April, the research team from Veros Real Estate Solutions published a ranking of what they felt would be the strongest real estate markets in the country over the next year or so. Their forecast was based on expected home-price growth through March 2020. Two Idaho housing markets were ranked among the top-three metros, in terms of predicted price growth. They were Idaho Falls and Boise. But some real estate markets are expected to outperform the national average, posting bigger home-price gains over the next year or so. And they include the Boise and Idaho Falls metro areas. Veros (a property valuation and analytics company) creates quarterly “VeroFORECAST” reports that include hundreds of metropolitan areas across the U.S. Their latest forecast ranked Idaho Falls in the number-one spot, and put Boise at number three. The table below shows the housing markets that are projected to see the biggest home-price gains over the next year or so. The percentages in the “forecast” column show the company’s expectation for price growth over the 12-month period from March 2019 to March 2020. Veros isn’t the only group offering strong forecasts for Idaho housing markets. The real estate information company Zillow has also predicted solid gains for the state’s major cities. The gains recorded over the past 12 months were roughly double the national average (7.2%) for that same period. Likewise, the company’s long-range forecast for Idaho Falls is higher than their outlook for the nation as a whole. The numbers for Boise are even higher. In April, Zillow reported a whopping 18.1% increase in Boise home values over the previous 12 months. Looking forward, they predicted that prices in that housing market would rise by nearly 10% over the next year. 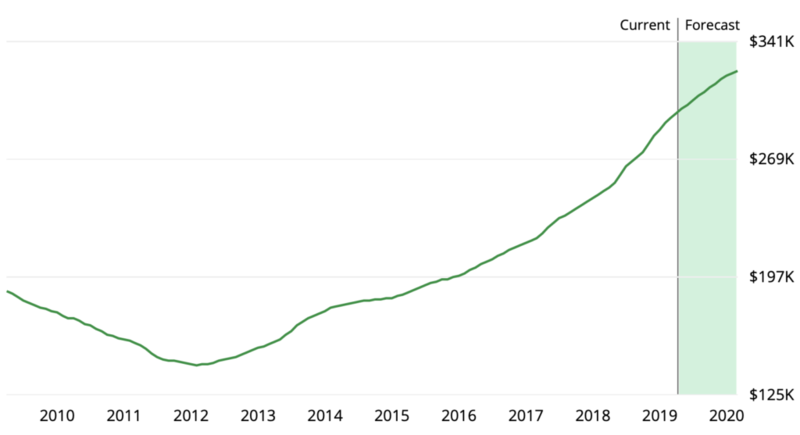 The line chart below, provided by Zillow, shows the company’s “Home Value Index” for Boise, Idaho over the past ten years. Chart: Home values for Boise, ID. Source: Zillow.com. You can see the drop in prices that occurred in the wake of the Great Recession, followed by a steady upward climb in the subsequent years. The company’s forecast for this housing market (shown in the green shaded area) predicts a continuation of this upward trend. Steady population growth has boosted both of these housing markets — and especially Boise. Both cities (and their surrounding metro areas) have outpaced the national average in terms of growth. In 2017, Boise was ranked as being the fastest-growing of the 100 largest metro areas in the country. The area’s population grew by more than 3% in that one year alone. Population growth increases demand for housing, on both the rental and purchase side. So it tends to give home prices a boost. This is partly why cities like Boise and Idaho Falls are getting strong housing market forecasts right now. Disclaimer: This article includes home-price predictions stretching into 2020. Those projections were provided by third parties not associated with the Home Buying Institute. Housing forecasts are the equivalent of an educated guess.